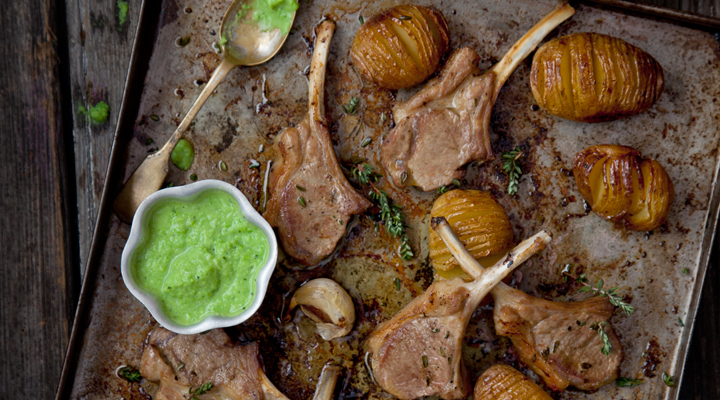 Kids will love to pick up these lamb cutlets, dip them in the flavoursome green purée and tuck into the juicy meat from the bone. Use waxy potatoes if possible, as floury ones won't crisp up as well. If using regular potatoes, they will need a longer cooking time depending on size. To make the hedgehog potatoes, place the butter and oil on a large baking tray and pop it in the oven to melt and warm through while you prepare the potatoes. Sit one potato in the ‘cup’ of a wooden spoon and using a sharp knife, carefully cut slits across it at 3mm intervals. The spoon edges stop you from cutting right through the potato, which is what you want. Repeat until all the potatoes are done. Remove the tray from the oven and carefully place the potatoes and garlic in the hot fat. Toss them around until evenly coated before arranging the potatoes cut side up. Brush the hot fat over the tops so it goes down between the slits. Sprinkle a little salt on each one and scatter the thyme over. Pop in the oven to roast for 20 minutes. Meanwhile, toss the oil and thyme leaves for the lamb together in a shallow bowl and season with salt and pepper. Add the lamb cutlets, massaging the oil all over, and set aside until needed. Once the potatoes have been roasting for 20 minutes, nestle the cutlets on the tray in a single layer. Brush the potatoes with the hot fat once again and then return to the oven for a further 20 minutes, turning the lamb cutlets over halfway through. Meanwhile, to make the pea dip, first, heat the oil in a sauté pan over a medium heat. Fry the onion for 6 to 8 minutes, stirring regularly, until softened and just catching colour. Add the garlic and fry for a further minute. Add the peas and cook for 1 minute before adding the stock. Simmer for 3 to 4 minutes, until the peas are tender. Tip the mixture into a blender and add the yogurt and half of the mint leaves. Blitz until as smooth as possible. Season to taste and keep warm. This can be made up to a day in advance and reheated gently before serving. Once cooked, the potatoes should be crisp and golden on the outside and the meat evenly browned all over. Arrange on serving plates, scatter the remaining mint leaves over and serve each one with a small bowl of the pea purée for dipping the lamb ‘lollipops’ in. Try using a 0% fat or low-fat natural yogurt in the pea dip.